Kingdom Calling gives Christian financial advice designed to synchronize your calling and your personal finances so that your financial planning decisions are in line with God’s purpose in your life. 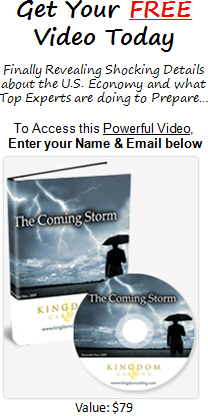 Some of our clients choose to begin our process slowly, by reading our blog or watching the video, “The Coming Storm” – a Christian understanding of the world as it is today, and the pitfalls and promises these seminal days hold for those in God’s family. Designed and developed by stewardship advisor Wes Bridel, Kingdom Calling’s financial programs and targeted investment strategies equip you with the wisdom and understanding to steward every asset God has blessed you with. For those that want an action plan they can implement today, Kingdom Calling created Your Fruitful Tree, a toolkit of Christian financial advice you can use to quickly assess, understand, and improve the things that have the most influence on your personal finances, and your overall financial health, security and prosperity. Finally, for those who are ready to fully become the good stewards He intended you to be, there’s The Steward’s Calling. Kingdom Calling’s “The Steward’s Calling” program helps you develop your understanding of God’s calling on your life. To truly live the Life He calls you to is to grow in knowing His voice and following Him…only doing what you see the Father doing. This second-to-none investment program goes well beyond Christian financial advice, walking you through seven stages of financial stewardship that help to clarify your life’s purpose and equip you to better steward every area of your financial life. The goal is developing understanding and wisdom to always grow as a steward – not just financial actions steps to complete and forget why you did them. Our members have found this process leads to a significant transformation in their financial well-being, allowing them to protect, preserve, and produce in greater measure than they thought possible. Need help understanding your finances? Learn how the Kingdom Calling’s “The Steward’s Calling” program can guide you. Learn more about the Kingdom Calling Financial Program and discover what makes our process second-to-none. Learn how we’ve helped others — just like you — align their spiritual calling and personal finances. If you’re not ready to contact us, that’s okay. Please sift through our free investment tools & suggestions before you get to know us.